Summary : Originally a novel by Yamazaki Toyoko, and later a 1974 movie. The book depicts the conflicts within the Manpyo family, which is famous in Kansai's financial circles, amidst the tumultuous reorganisation of the financial industry of the late 1960s. Unlike the book, the eldest son, Teppei, and not the father, Daisuke, will be the central character of the drama. 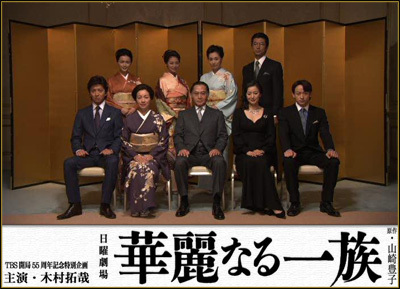 This drama is set in the late 1960s decade of Japan. The main rivalry depicted in the story is between Manpyo Daisuke (Kitaoji Kinya), a powerful banker, and his eldest son, Manpyo Teppei (Kimura Takuya), the executive managing director of a steel firm. For some reasons, Daisuke seem to dislike his own son and as Teppei seems to find out the reason for Daisuke's hatred, his whole life is turned upside down with fatal consequences.